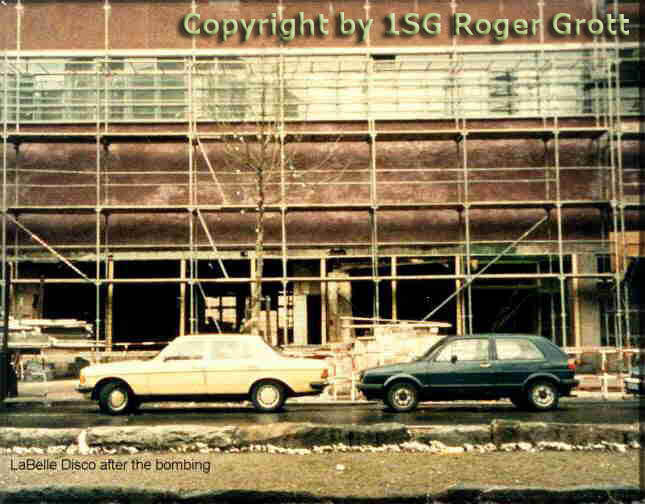 On April 5th at 1:40 am a two kilogramm bomb made of Semtex plastic explosives blows up the La Belle Disco. The club was located on Hauptstraße 78 in Friedenau a subdistrict of the Schöneberg district. The club was very popular with American soldiers stationed in Berlin. The bomb was placed next to the dance-floor and filled with shrapnel. Sergeant Kenneth Ford (21) and a turkish woman died instantly. Sergeant James Goins (25) died in the hospital. More than 200 people were wounded. A lot of them still suffer from the terrorist attack today. Intercepted messages from Libya identified its leader Gaddafi as the brain behind this act of terror. Ten days after the bomb went off the Lybian capital Tripoli and the city of Benghazi were bombed by US Air Force planes. Colonel Gaddafi survived the bombings. The La Belle bombing was seen as revenge for the sinking of Libyan patrol boats by the US in march 1986. No further evidence could be collected until the reunification of Germany when STASI files were opened for investigation. Prosecutors identified Musbah Eter who had worked at the embassy of Libya in East Berlin as an agent. He and four other suspects were arrested and put on trial in 1997. The trial lasted four years. Musbah Eter was sentenced to 12 years in prison. The two other men were Yasser Shraydi and Ali Chanaa the latter also working for the STASI. The other two suspects were Chanaa's German wife Verena and her sister Andrea Häusler. The sisters used to go out at clubs where American soldiers hung out well before they got in touch with any terrorist activities. They chose the La Belle disco as the target for the bombing. Verena Chanaa carried the bomb into the club accompanied by her sister. Verena was charged with murder and was sentenced to 14 years in prison. Her sister was aquitted because there was no prove that she knew about the bomb.